Hornady ammunition has always been known for its exceptional accuracy, consistency and high standards. Their TAP (Tactical Application Police) rounds have been at the forefront in the development and application of law enforcement-specific ammunition for years. 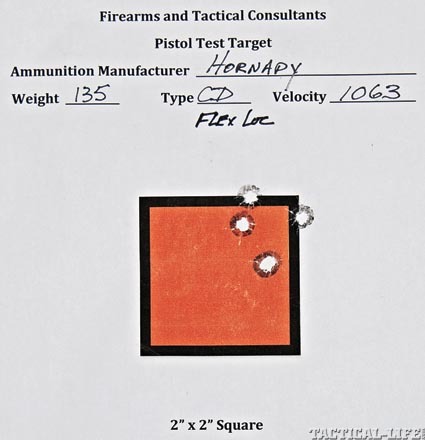 I first came across Hornady TAP 7.62x51mm 168-grain BTHP close to 10 years ago, and it was easily the most consistent and accurate factory ammunition my rifle had ever used. Later, when the need arose for a less penetrative bullet, the 168-grain TAP (A-MAX) round was tested as well and remains our team’s primary deployment round to this day. Over the years, Hornady has always produced excellent ammunition, so I jumped at the chance to attend a media trip for the company’s newest pistol ammunition designed specifically for the police market. A common misconception about self-defense ammunition is its ability to automatically be effective in the law enforcement environment. Some would tell you any self-defense ammunition is perfectly suited for police applications and vice-versa. It is a convenient notion, especially if you are selling really expensive ammunition. There is only one problem: It is not always true—especially in cases where officers need to penetrate intermediate barriers. Officers may need to shoot through car glass, doors and other barriers. Although that may occur in a non-sworn self-defense situation, it’s very rare. For a police officer, it is a strong possibility in most shooting incidents. When it comes to pistol ammunition, a civilian generally needs the best possible expansion with proper penetration through soft tissue. A police officer needs this as well, but the bullet must also work as effectively after passing through drywall, plywood, glass, heavy clothing and even car doors. It is this balance that is really difficult to acquire and why so much testing goes into any change in duty ammunition. Generally, the ability to penetrate barriers has affected terminal wound ballistics in soft tissue alone. Early in my career, the ammunition issued often failed to penetrate and, more importantly, stay together after going through most barriers. The .38 +P ammunition first issued would not penetrate drywall, let alone a windshield. Luckily, ammunition improvements have solved many of these issues. The advent of bonded bullets certainly helped on that front, but this often meant greater over-penetration or, more critically, a lack of bullet expansion. The bottom line with handgun ammunition ballistics is the size of the permanent wound cavity. Greater expansion results in a larger wound with more rapid blood loss and tissue damage. The latest ammunition generally offers the appropriate penetration through soft tissue and barriers, consistent expansion, near complete bullet weight retention, and solid accuracy. 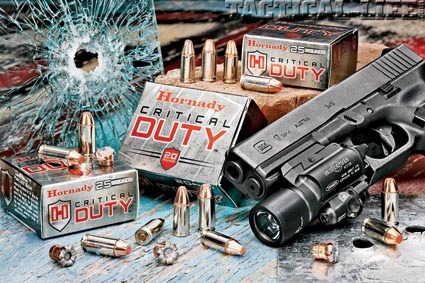 Hornady’s new Critical Duty pistol ammunition fits nicely into this category. 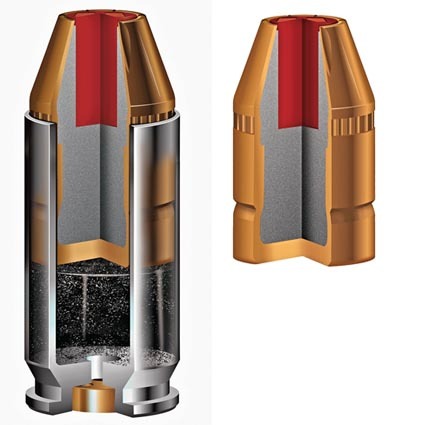 The new FlexLock bullet features a Flex Tip (shown in red) to prevent “clogging” while passing through materials. Hornady’s new Critical Duty ammunition, currently offered in 9mm and .40, features a new FlexLock bullet. Starting with a high-antimony lead core, it is extremely tough and expands consistently. A Flex Tip initiates the expansion of the bullet while preventing material from “clogging up” the hollow point. This becomes extremely important when shooting through media, as this clogging effect often results in significant over-penetration. Many traditional hollow-point rounds simply turn into full metal jacket rounds once filled with plywood, drywall or even clothing. The jacket and core are then locked together using a heavy-duty InterLock band. This results in the same effect as a bonded bullet without the issues sometimes associated with the bonding process. The bullet is cannelured and crimped to prevent setback from the daily loading and unloading a police officer must often engage in. Placed in nickel–plated cases to resist corrosion and utilizing low-flash powders, the ammo is more effective in all conditions. The overall design results in a round perfectly suited to retaining its weight through all kinds of barriers. The 9mm round uses a 135-grain bullet with a stated muzzle velocity of 1,010 feet per second (fps) in the standard load. A +P version uses the same bullet at 1,110 fps. The .40-caliber uses a 175-grain bullet with a stated velocity of 1,010 fps at the muzzle. Initial evaluation at the media event started with a complete ballistics test utilizing the FBI protocols. These protocols were developed so the FBI could provide ammunition to its agents that works in all conditions. Over the years, these protocols have become the default testing process for any ammunition fielded in the LE world. It consists of shooting calibrated gelatin that approximates soft tissue. Not only is the bare gelatin fired upon alone, but it is also fired upon through intermediate barriers. Denim is used to represent heavy clothing. The round is also fired through drywall, plywood, window glass and steel. In order to meet the standards, a bullet must penetrate a minimum of 12 inches, with 18 inches or so being the ideal. This assures that any bullet would pass through the barrier and then deeply enough into a threat to cause the appropriate damage to internal organs. Both the 9mm and .40 loads were tested. 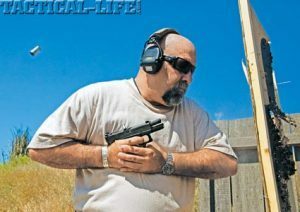 The test pistol was a full-sized Glock Gen4 for both. It was a cold and wet day, so all of the testing was done under some tent awnings at the range. The resulting blocks of gelatin were set aside for pictures, then each wound cavity was filled with dye for better viewing. Bullets were then removed and weighed. The ammunition performed about as well as it can perform. The least penetration through any of the media was 13 inches through the glass for the 9mm. The greatest penetration was the same round through the bare gelatin at a tad under 17 inches. The rest of the rounds without regard to caliber fell between 14 and 16 inches, with 15 inches being the norm. It was this consistency that was most impressive. Having been to a dozen of these tests, the tendency is to see some pretty wide swings given different materials. This stuff was really consistent, however. Bullet weight retention was near 100 percent for both calibers. It’s very difficult for bullets to consistently penetrate glass. The 135-grain 9mm Critical Duty round punched through glass and almost 13 inches into ballistic gelatin—an impressive feat. We moved to a different part of the range to test this ammunition through some new guns. The pistols were Glock 22 Gen4s in .40 and G17 Gen4s in 9mm. Each of us fired close to 200 rounds. Many shooters were getting solid accuracy out to 25 yards. We moved to some steel and ran the pistols pretty quickly. I experienced a few failures to eject, but the weather was not ideal and the ammo performed perfectly once the pistols were changed. All in all, the Critical Duty line worked well and the accuracy was fine given the conditions. Upon my return home, some standard 9mm and .40 ammo was secured and tested through my Smith & Wesson M&P40 Pro that’s been customized by Red Creek Tactical. 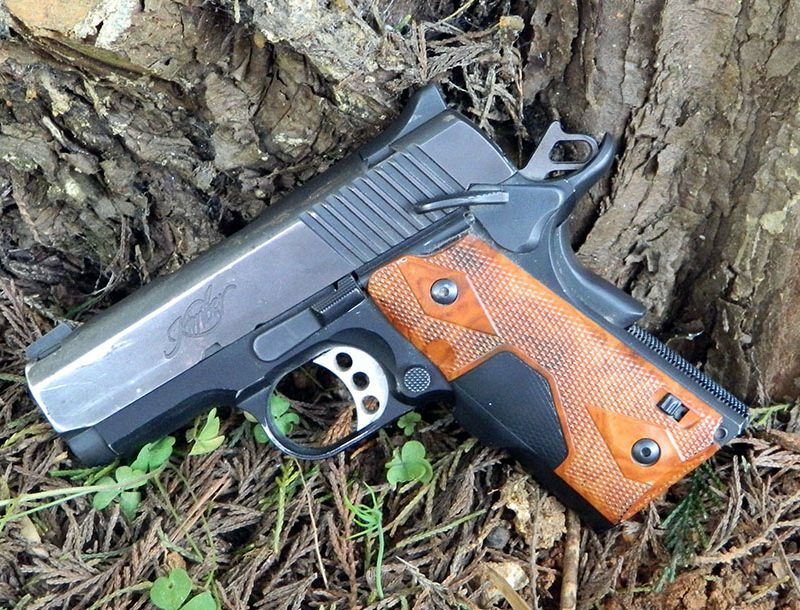 It is a .40-caliber pistol with a KKM barrel in 9mm so the same pistol was used in both tests. In this case, the ammunition was flawless in performance. 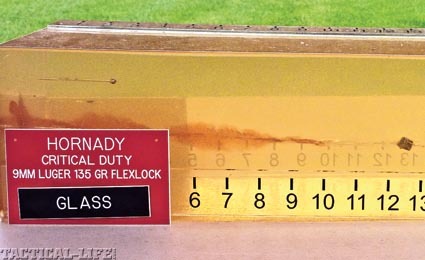 Groups were fired at 25 yards from a bench with excellent accuracy. I was able to wring out a 1-inch group with the 9mm and a bit under 2 inches in .40 caliber. That is mostly the lack of recoil in the 9mm and the superb accuracy of the KKM barrel. All in all, more than acceptable accuracy for sure. There are lots of great choices for duty rounds these days as ammunition companies are really stepping up to the plate. Improvements in materials and manufacture have really changed the game. 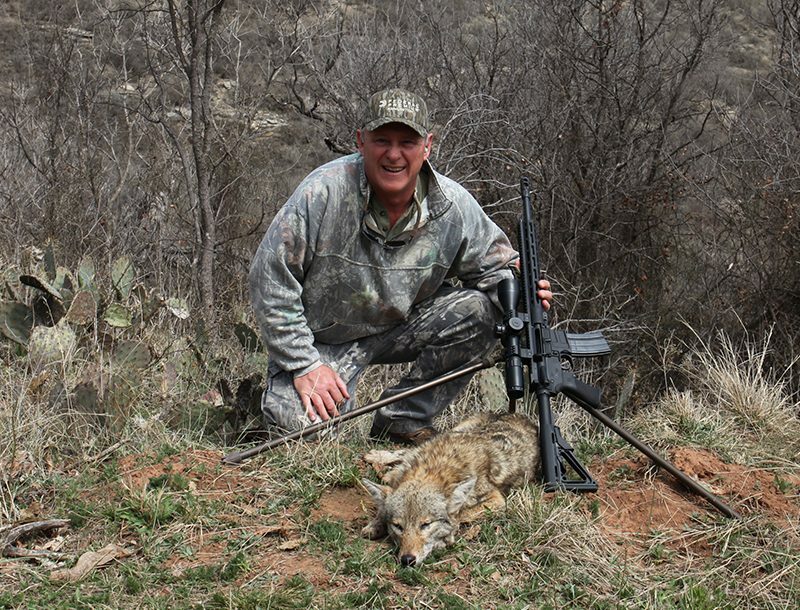 Hornady has introduced a real winner here. It may be the most consistent penetrator through various barriers I have ever tested. It is incredibly accurate in my tactical duty pistol, especially in 9mm, and is completely reliable. For more information, visit hornady.com or call 800-338-3220.